Great value picture performance. Up to 4x HD resolution for a more detailed picture. High Dynamic Range for wide colour spectrum with more detail in bright and dark scenes. Move the stand to fit your furniture or accessories (eg soundbar) perfectly. Great choice of 4K TV at your fingertips. Get Netflix straight from the remote. Catch-Up with unique Discovery Bar and Quick Look Guide. Catch-up straight from the TV guide, unique quick look-up feature with programme images. When you connect a USB storage device to your Toshiba TV, you can playback all your downloaded music tracks and movies on the big screen. The latest Ultra HD innovation is built into the unique IPS 4K panel meaning your entertainment is viewable from any angle without distortion. The FX700 series delivers amazing 4K HDR pictures and has a sophisticated, yet easy to use Smart TV Platform. Premium slim LED panel with dark metallic trim and stand - which can be adjusted to fit your TV cabinet. Accurate Lifelike Colour, thanks to Enhanced Picture Processing. FX700's 4K HDR technology draws on Panasonic's many years of great picture quality know how to delivering beautiful and accurate images. Delivers Colours with Absolute Accuracy Over a Wide Spectrum. By using special Wide Colour Phosphor Technology capable of producing a wider colour range, FX700 covers more than 90% of DCI standards. Wide Colour Spectrum TVs give you a more subtle, naturally toned colour palette which, unlike most LCD TVs, still looks authentic in any scene. Our TVs support multiple HDR formats, such as HDR10 and Hybrid Log Gamma (HLG). To enhance your HDR experience, we have unique functions, such as Auto Brightness Enhancer, to adjust video in response to light levels in your room. Real Life Images Created with High Contrast. Backlight control and signal processing combine to control the brightness in hundreds of areas for outstanding contrast expression. They also render fine hues and produce images with exceptional depth. Your Favourite Programming in the Optimal Viewing Mode. Sport mode combines vivid hues with a surround sound effect for viewing football, and other stadium sports, as if you were at the game. The quick image response of Game mode brings you a more responsive playing sensation. Adjustable Stand Designed to Fit your Existing Furniture. Wide or narrow with two distinct styles from one "Switch Design" stand. The Samsung UE49NU7100 49" Smart 4K Ultra HD HDR LED TV uses the latest technology for realistic images. HDR10+ creates superior brightness and authentic colours, making it feel like you're stepping onto a new world right alongside Captain Kirk. An outstanding processing speed eliminates motion blur, keeping even the most action packed scenes clear and crisp. Brightness is controlled in individual zones across the screen thanks to UHD Dimming, so you can have bright light and dim shadows in the same image without losing detail in either. With so much great entertainment across Netflix, Netflix, and more it can be difficult to know what to watch. The Universal Guide will sift through all of these, and more, in order to recommend popular shows, and find content tailored just for you. Spend less time flicking through the options, and dive in to your favourite show. The TV guide goes beyond the standard TV channels. With Samsung TV PLUS, you'll have be able to purchase the latest UHD movies straight from the TV guide. These are available in the Smart channels that come with the program guide, and open up a realm of new content for you to consume. Control the Samsung NU7100 from your mobile. You can control what you watch without even picking up the remote, as the Smart View app has all the same functionality. You can even search for your next programme on your phone without disturbing the main screen. Fire up the Smart Hub to find games to play with your friends, and your phone will convert into a controller. The TV's minimalist design is carried through to all angles. The back is smooth and unobtrusive, and cables can be coaxed into grooves to prevent unsightly clutter. With 4K X Reality Pro, every image is upscaled closer to true 4K quality for remarkable clarity. Images are sharpened and refined in real time, revealing extra detail in the books and architecture of the library. See vivid real world colours all around you. A Triluminos Display maps from a wider palette, faithfully reproducing every shade and hue. This TV brings you the excitement of movies and games in 4K HDR. It handles a variety of HDR formats, including HDR10 and Hybrid Log Gamma. Connect Google Home for seamless hands free control of a Sony TV. With Google Home, you can find and cast your favourite videos to your Sony TV, without lifting a finger. Sony's 4K HDR televisions are perfect partners for PlayStation and PlayStation Pro consoles. Immerse yourself in a responsive, fun filled gaming experience with vivid textures and intensely vibrant colours. See your favourite games come to life with incredible picture quality. Spend less time browsing, and more time watching. Voice search on Android TV provides you with the power of Google search, allowing you to find content across different services without the hassle of time consuming text entry. You can also get recommendations, asking for romantic comedies for example, brings up a list of suitable options. Enjoy smooth and sharp details even in fast moving sequences with Motionflow XR. This innovative technology creates and inserts extra frames between the original ones. It compares key visual factors on successive frames, then calculates the split second of missing action in the sequences. Some models also include black frame insertion for a blur free and truly cinematic look. Low resolution Internet video, catch-up TV and other heavily compressed audio files don't always sound so great. A large amount of information gets thrown away when digital audio is compressed. With Digital Sound Enhancement Engine(DSEE) technology, lost frequency components especially high frequencies are restored for natural sound with a more spacious feel. Make your listening as lifelike as your viewing. Clear Audio+ fine tunes TV sound for an immersive experience that seems to surround you. Hear music, dialogue and surround effects with greater clarity and separation, whatever you're watching. 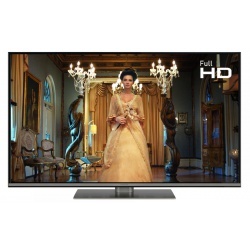 This range of 4K UHD TVs deliver stunning picture quality and are compatible with the digital Europe UHD requirements. Bravia uses a powerful computer model to analyse and compensate for inaccuracies in speaker response. It does this by sampling the speaker frequency with higher precision. This information is fed back to cancel out any peaks or dips in the speaker's natural response resulting in pure, natural audio with smooth, even reproduction of all frequencies. Enjoy an immersive soundstage that pulls you into the heart of the action. S-Force Front Surround mimics the way the brain correlates sound sources to create proper volume, time lag, and sound wave spectrum using only left and right speaker channels. By naturally emulating three dimensional sound fields, you'll enjoy rich, high fidelity audio across a wider listening area. The Infra red blaster lets you control other devices in your home from your Sony TV remote. You can use it to control your Set top box or cable box with the TV remote controller. Store your favourite TV shows on an external USB hard disk drive to enjoy whenever you want. USB HDD REC allows one touch and timer recording of a digital broadcast onto any USB HDD device up to 2TB in capacity. While viewing the show, simply press REC to start recording, which will automatically stop at the end of the programme. With Youview built in, you can scroll back up to seven days to watch shows from BBC iPlayer, ITV Hub, All 4 and Demand 5. You can also access an extensive library of on demand content. Simply connect your Bravia to an aerial and broadband connection to get started with Youview. See how our processor, picture up-scaling and colour reproduction technologies come together for amazingly realistic 4K HDR entertainment on this large screen TV. With 4K X-Reality PRO, every image is up-scaled closer to true 4K quality for remarkable clarity. Images are sharpened and refined in real time, revealing extra detail in the books and architecture of the library.